"For those who love salmon, here's a new way to switch it up a bit. Simple and easy, yet simply satisfying! You will want more and more. It's rich, has a nice tangy flavor to it, and is absolutely delicious!" Heat olive oil in a skillet over medium heat. Stir in the onions, green onions, and pesto. Cook until tender. Mix in salmon, and cook until heated through. Stir in 1/2 the Parmesan cheese, and continue cooking 5 minutes. 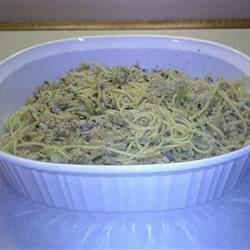 Toss with the cooked pasta, and sprinkle with remaining Parmesan cheese to serve. See how to make a simple springtime pasta with salmon. I used baked salmon and skipped the onions because I didn't have any. I used more pesto than called for as well. This was pretty good! A different way to eat salmon, but I liked it.